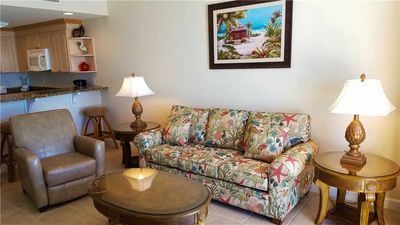 Emerald Beach Resort 2227 is professionally managed by ResortQuest by Wyndham Vacation Rentals. 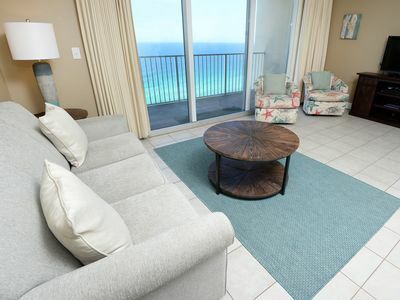 Emerald Beach Resort 2227 is a gorgeous one-bedroom, two-bath condo offering incredible gulf-front views of the sparkling crystal-clear waters and most famed white sandy beaches. 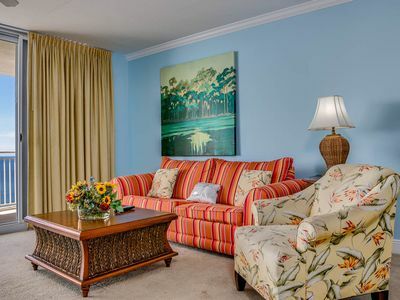 With a king-sized bed in the bedroom, a twin-sized bunk bed nestled in the hall, along with a queen-sized sleeper sofa in the living room, Emerald Beach Resort 2227 accommodates up to six guests comfortably. 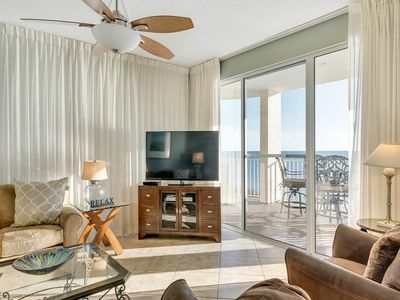 Whether you are taking a family beach vacation, going on a spontaneous trip with friends, attending a special event or any occasion between, Emerald Beach Resort 2227 has got you covered. 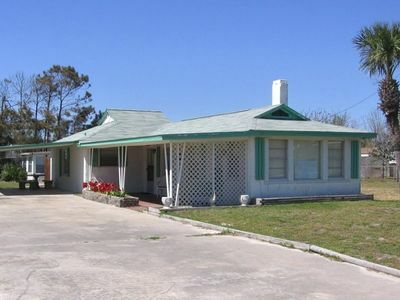 Upon entering, you will find the bedroom on your right, featuring a television and leading into a full bathroom. This bathroom offers a single vanity and tub/shower combination. 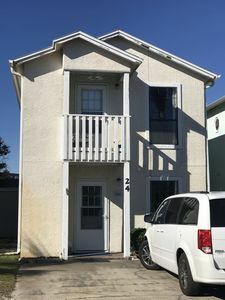 The twin-sized bunk bed is nestled in the hall on the right, perfect for children or additional guests to relax and unwind in their own space. 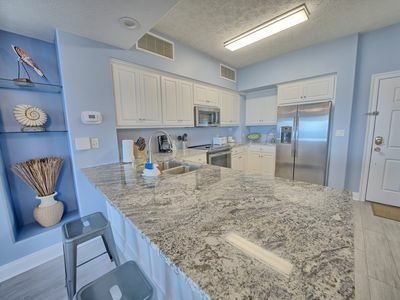 Down the hall is the fully-equipped kitchen, with gorgeous granite countertops, plenty of storage space, along with all utensils, appliances and cookware needed to create your favorite meal while on vacation. 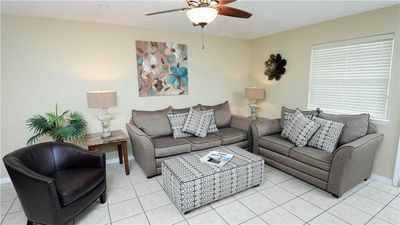 The kitchen opens into the dining area and living room, providing plenty of space for the whole family. 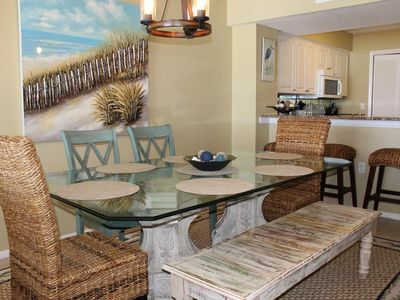 The dining table seats three guests comfortably and there are two additional bar chairs by the kitchen breakfast bar. 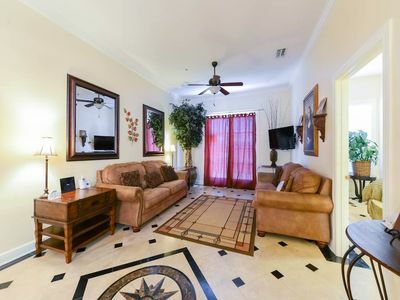 Step into the inviting living room, boasting comfortable furnishings and matching décor, along with a large flat-screen television and DVD player combination. 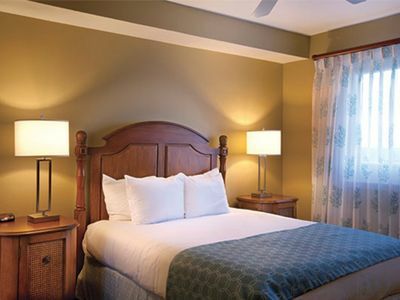 Cozy up with your loved ones for a movie night after a long day of soaking up the sun on the beach or exploring all that Panama City Beach has to offer. 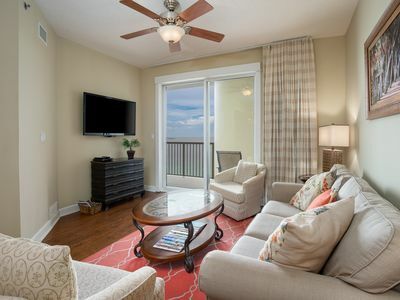 Step out onto the private, furnished balcony, ideal for sipping on your morning coffee while watching the sun rise or kicking your feet up and relaxing in the evenings while taking in the stunning colors of the sun setting over the Gulf of Mexico. 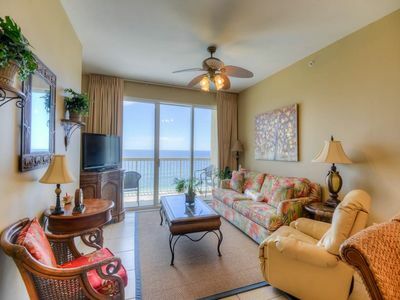 Emerald Beach Resort 2227 can easily become your vacation go-to for years to come. 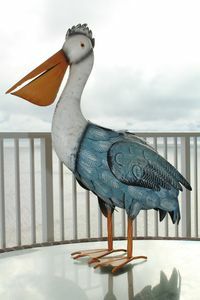 When you stay in Panama City Beach, the Emerald Beach Resort is right where you want to be for a beach vacation to Northwest Florida. 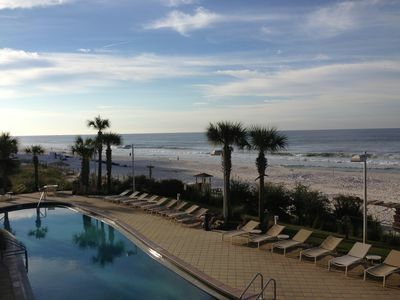 Located directly on the beautiful and brilliant white-sand beaches, Emerald Beach Resort offers spectacular views of the warm, emerald-green waters of the Gulf of Mexico. While here, guests can enjoy a dip in one of our pools, or have a beverage from our Tiki Bar or Sky Bar (hours vary by season). If you need a bit of help getting started in the morning, stop by the onsite Starbucks® or get your blood pumping at the onsite fitness center. 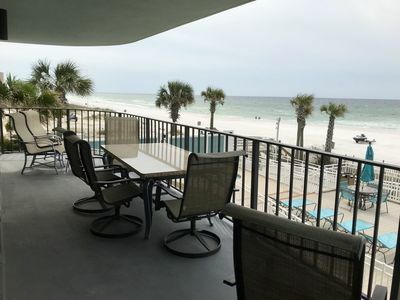 The Emerald Beach Resort is located a quick mile from the shopping, restaurants and entertainment of Pier Park and minutes from Frank Brown Park. 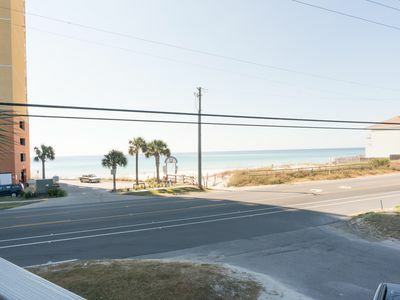 These amazing vacation rentals in Panama City Beach are also only fifteen minutes from Northwest Florida Beaches International Airport. 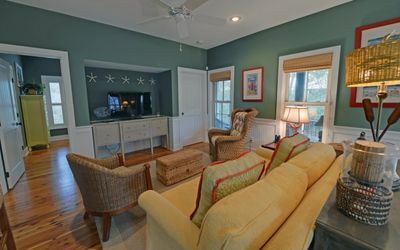 Village of South Walton H191 - Book your spring getaway! 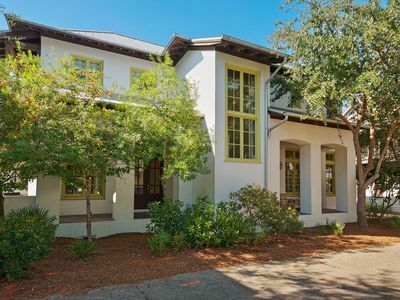 High Pointe E21 - Ready, set, book for spring! 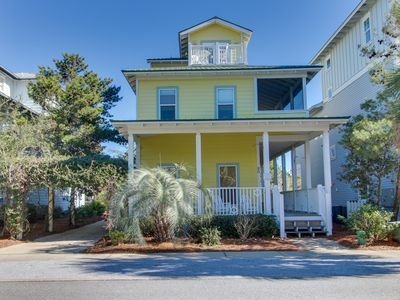 Tidewater 1714 - Don’t miss your spring vacation. Book now! 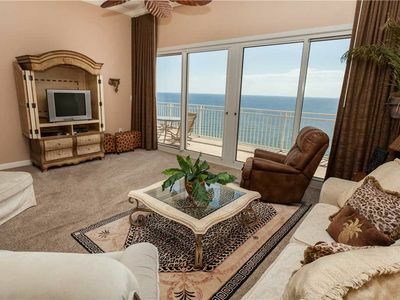 Luxury Resort Condo W/Breathtaking Views, Large Balcony, FREE BEACH SERVICE!